Did I finish my Sewlution? No mistress of the jar, I didn't, woe is me. However I did start an ambitious (for me) project and I learned and did a whole heap of new things, so I don't feel dissapointed with myself, infact I feel quite pleased. What has the Audrey in Unst Cardigan taught me so far? I can follow a pattern...who would have thought! I knitted for the first time with a 3 ply yarn, knitted acres of Twisted rib, tried my first simple lace stitch and Increased and decreased when told to...mile stones for me. 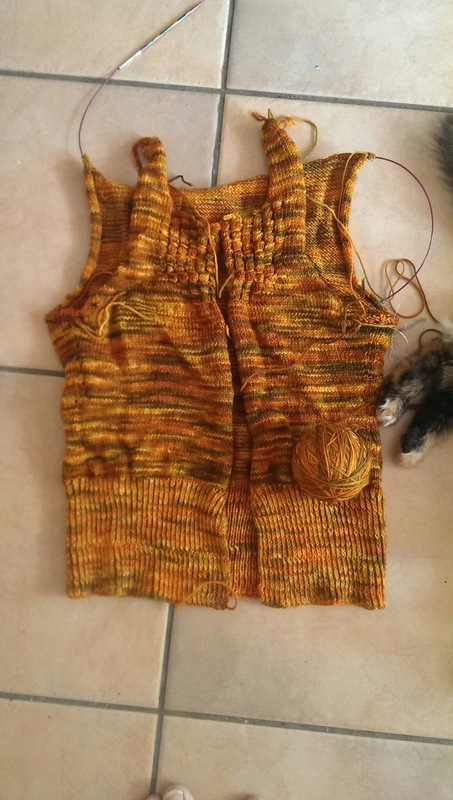 The knitting came to a halt when it was time for the sleeves, around October. I knew I would need some clear hours of concentration to work out that part, hours which haven't been available so much at the end of the year (and it's much hotter too). I will finish, but it was the Sewlution that got me started. Thanks Karen!